The Actisense NGW-1 NMEA 2000 Gateway is the easist way to link between a boats old and new data networks. The NGW-1 can convert NMEA 0183 data into NMEA 2000 data and vice-versa. Using the advanced configuration software provided, it is straightforward to set up which data conversions are required for both directions. Please go to the Downloads tab to see the up to date list of conversions the various configurations can handle. Multiple NGW-1 units can be used to multiplex numerous NMEA 0183 devices onto the NMEA 2000 network, using the network as a means of combining and transferring all data items from one place to another. The Actisense NMEA Reader software utility allows the NGW-1 user to view and understand (in detail) the translated NMEA 0183 sentences output by an NGW-1 directly. NGW-1-ISO is the standard option. With an opto-isolated input and ISO-Drive output for direct NMEA 0183 device bi-directional connection. 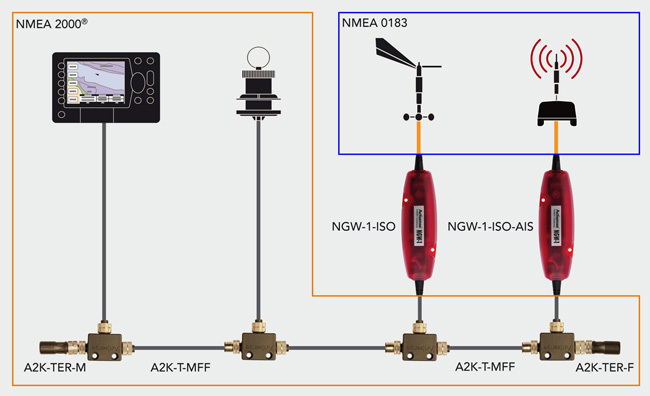 NGW-1-ISO-AIS is the NMEA 0183 AIS option. This is a pre-configured version of the standard NGW-1-ISO that enables the conversion of NMEA 0183 AIS data to its equivalent in NMEA 2000. This provides an 'out of the box' solution for quick installation with no configuration required. Please see the conversion list in the downloads section to see which AIS conversions the unit can perform. NGW-1-USB is the NMEA 0183 chartplotter option. USB (1.1 and 2.0) interface for bi-dircetional connection to a PC. NGW-1-STNG is the Raymarine SeaTalk NG option. This version enables users to convert NMEA 0183 data into SeaTalk NG and vice-versa, providing seamless integration with Raymarine products. The NGW-1-STNG option combines a standard NGW-1-ISO with a Raymarine SeaTalk NG adapter cable to interface legacy instruments to the NMEA 2000 based SeaTalk NG bus.